A dried berry, fried in oil or ghee, is an intrinsic part of meals in south India. Slightly bitter, the berries have a peculiar taste, which one gradually gets accustomed to. Solanum torvum or the Turkey berry is known by several names—brihati marathi marang in Sanskrit, bhurat, bhankatiya in Hindi, sundakkai and chundakkai in Tamil. I was introduced to the berries at a very young age. I was told by my mother, “They are such holy berries that they chant ‘Shiva Shiva’ once they reach the stomach. And, with such blessings inside you, you can achieve anything. It is God’s blessing.” What more would a child want but to eat it before tension-filled maths and physics exams! It was only later that I learned about the medicinal properties of these humble, dried berries. There is an old saying in Malayalam: the jasmine grown in one’s backyard does not smell as good as the ones bought from the market. That’s how I felt while researching on the Solanum torvum berries. Usually, we overlook or ignore the medicinal value of what we eat regularly. In Tamil Nadu and Kerala, the berries are commonly eaten, and probably that’s why no one has researched it in-depth. The berries grow in clusters, and are slightly smaller in size than cherries. They have a nice green colour when picked for use, but are difficult to consume at this stage as they taste extremely bitter. But there are several ways to cook these fresh berries. Traditionally, it is dried and consumed in innumerable ways. For instance, to make vathal, the berries are washed thoroughly and then crushed slightly—berries with literally half-open mouths. They are then soaked in a solution of sour butter milk, which helps reduce the bitterness of the berries. And once again they are dried in the sun. Most south Indian shops stock the sun-dried berries, popularly called sundakkai vathal (see recipes). The berries have several curative powers. In Siddha medicine—one of the five alternative systems of medicine promoted by the Government of India—it is used to make what is called Sundavattral Choornam, which is excellent for digestion. This probably explains the “Shiva Shiva” in the stomach, an indirect way to make people consume it as it keeps stomach ailments away. Their digestive prowesses are exemplified by the fact that the berries have been traditionally used to break a fast. A number of religious-minded individuals observe fast on Ekadasi—the 11th day of the Lunar fortnight, just before Amavasya, when the moon is waning. Not a morsel is eaten the entire day. The next day, called Dwadashi, the fast is broken. After prayers, sundakkai is eaten as a part of the meal on the 12th day. It is compulsory. Since people have been rigorously fasting the earlier day, the digestive ingredients of the berries help calm the empty stomach and reduce acidity. Sundakkai is also effective in fighting diabetes, anaemia, anorexia, and can cure cold and cough. Solanum torvum is an important member of the potato family. Its curative properties have been proved in several scientific studies. 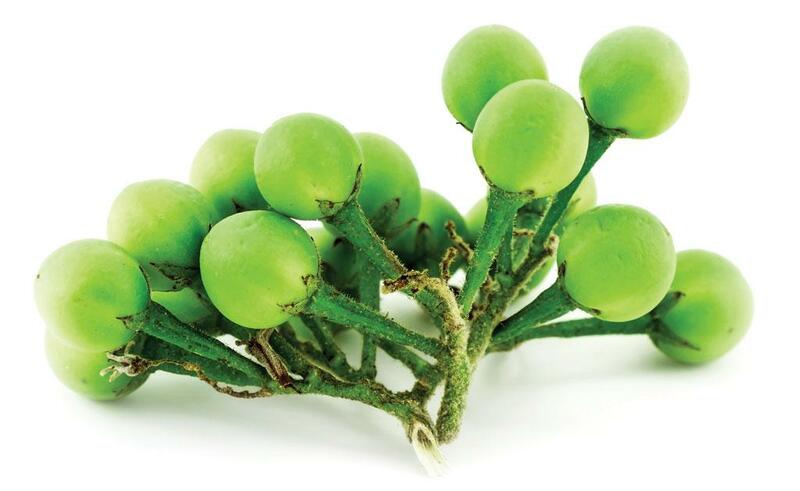 A phytopharmacological review by Ashok D Agrawal and colleagues, published in Der Pharmacia Lettre in 2010, reveals that the fruits of Solanum torvum are used commonly in traditional medicine for its antioxidant, cardiovascular, anti-hypertensive and anti-platelet aggregation properties. The berries also possess anti-microbial, sedative and diuretic properties. Solanum torvum is also added as an ingredient in various indigenous herbal medicines. 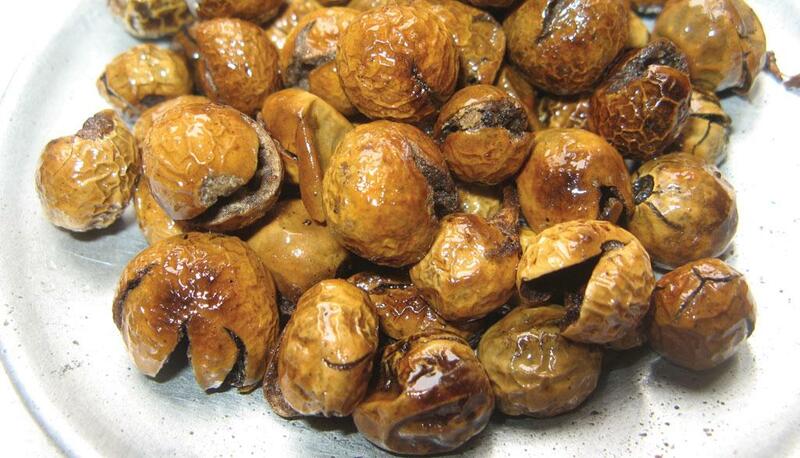 Moreover, anti-cancer compounds have also been found in the fruit and leaves of this plant. The presence of various potentially-important compounds in the berries calls for more serious research of this wonder food. Extract the tamarind juice. Add turmeric, hing, sambar powder and salt. Boil till the raw smell of tamarind goes. Now add the washed handful of moringa leaves, and wait for it to boil for a couple of minutes. Smash the boiled dal and add it to the sambar. If the sambar is slightly liquid, add rice flour to the boiled dal. This will help thicken the sambar. Once the liquid starts boiling, take it off the flame. Heat a little oil in a kadai and add the mustard seeds. Once it starts crackling, pour it into the sambar. Add curry leaves. Now shallow fry sundakkai vathal in a little oil. When it acquires a nice brown colour, take them out and add to the sambar. Status of regulation on traditional medicine formulations and natural products: Whither is India?